Please be advised that I offer this information for educational purposes only and will not be responsible for any use, misuse, accidents, mis-haps or other that may result from it. 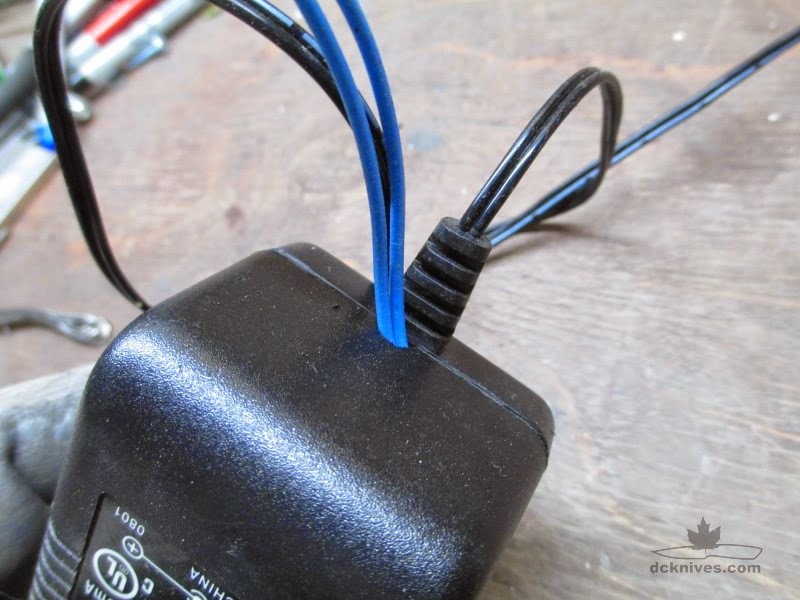 The adapter that is modified will lose any electrical approvals that are marked from the manufacturer. Obviously, the manufacturer cannot be responsible for the product after modification. When dealing with line power there is always a risk of electrocution. Please be very careful. 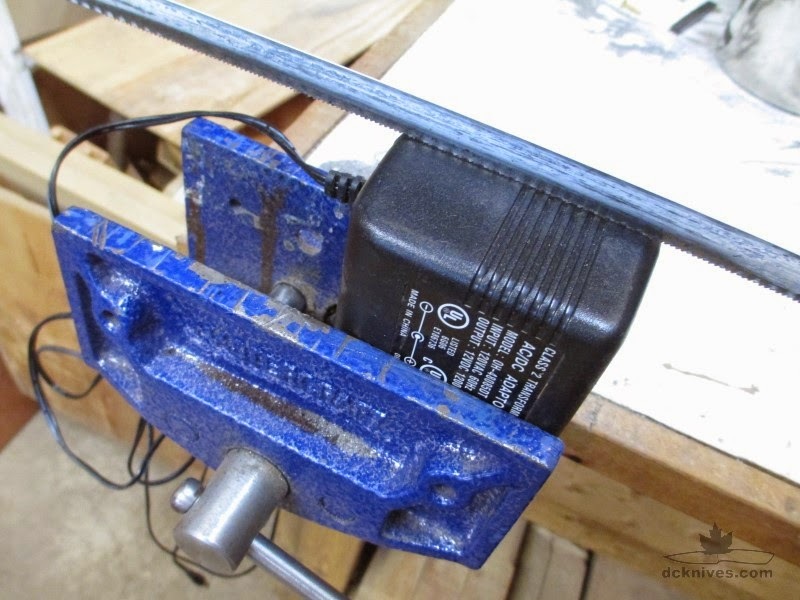 This project requires some skills such as COMMON SENSE as well as basic soldering. 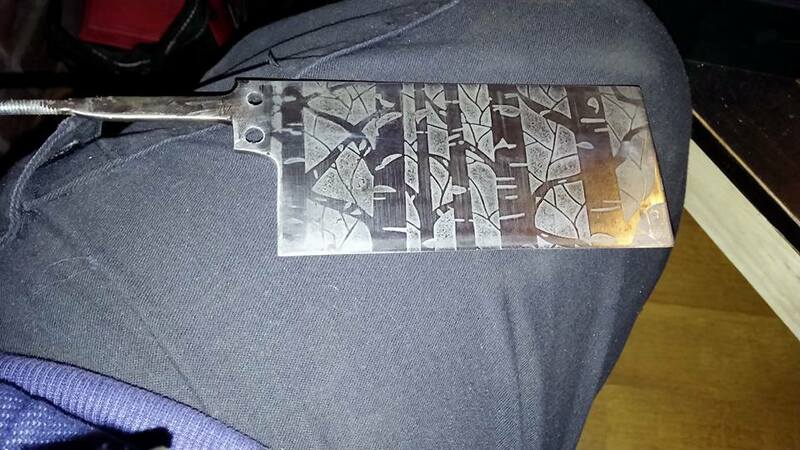 Electrolytic etching is a technique where electric current is used to remove metal from a substrate, in our case a steel knife. A Direct Current (DC) passes through a conductive solution which is called the electrolyte. 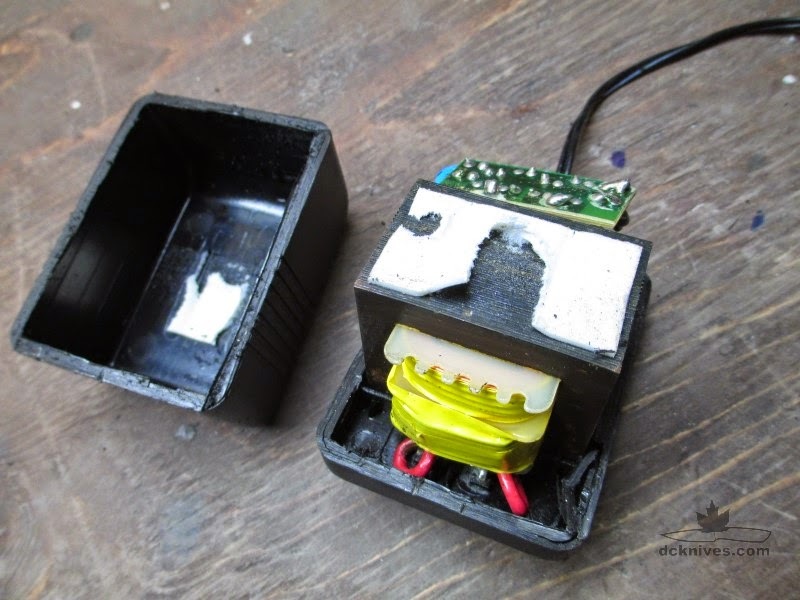 A very simple setup consisting of a battery, a couple of wires, a cotton ball and some salt water will remove metal from the knife wherever the current is allowed to flow. Being that the battery is DC, this circuit will ETCH, but we can do better than this. If we have a little bit of Alternating Current (AC) available, we can also MARK or blacken the etch with carbon. Before I get too far into the tutorial, I wanted to show you what Justin Boyd made with this style of etcher and a craft store stencil on a cleaver. Very cool! 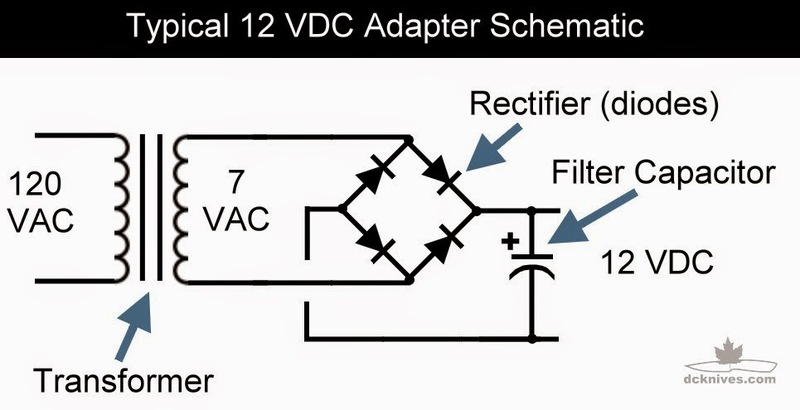 DC Adapter, 5 to 12 VDC, 1 Ampere or more. 6-32 X 1/2" machine screws. Piece of stainless steel for pad. Note: if this appears to be too complicated, try my simpler version here. The main component is the AC adapter. 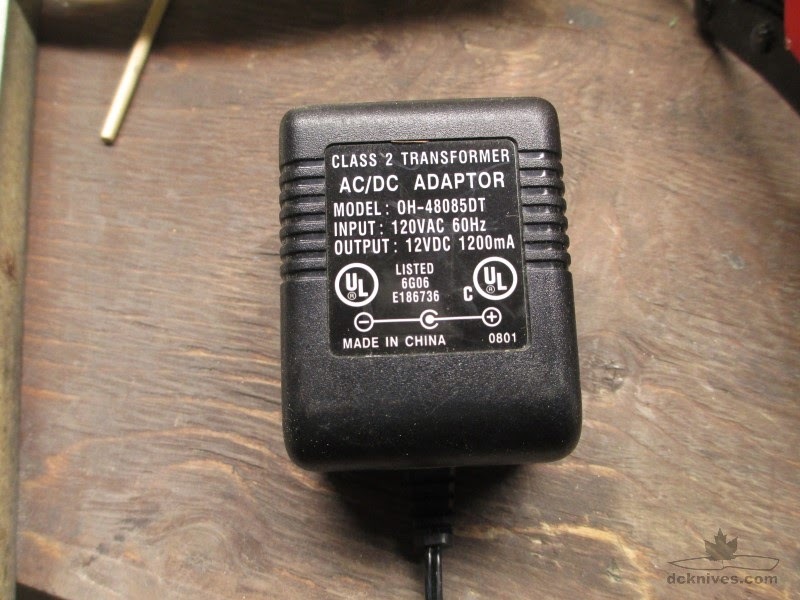 If you are like me, an old AC/DC adapter come from your junk bin of course! This is the kind of adapter you want to use. Do not use the rectangular one's from modern computers as these are "switch mode power supplies" and will not have the AC available. We want the old kind that feels like it's got some weight to it. Try for at least 5 Volts DC and 1 Amp or more. My local 2nd hand store has these puppies for $2. Below is a simple representation of how these old adapters work. They take the 120 Volts AC from your household receptacle and "transform" it to lower AC voltage. Then with diodes, the AC is rectified into DC and finally smoothed with a filtering capacitor. 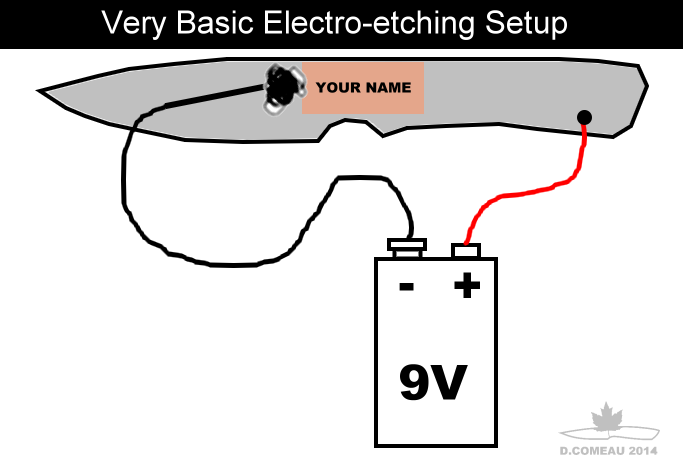 The more you understand this circuit, the easier it will be to construct your etcher. Let the fun begin! I opened this adapter up with a hacksaw. Carefully cutting around the seam. Do not go all the way through as you may cut some components. Rather, you want to get really close and then make the final cut with a utility knife. This is what we are looking for. Here you can see the transformer and the circuit board. Here I have identified the components as per the diagram. This is a schematic of what we want to make. You see the same basic adapter with some additional items like a few wires, a switch, an alligator clip and a pad. What we really want to do here is bring out the AC along with the existing DC wires and connect the wires to a switch. 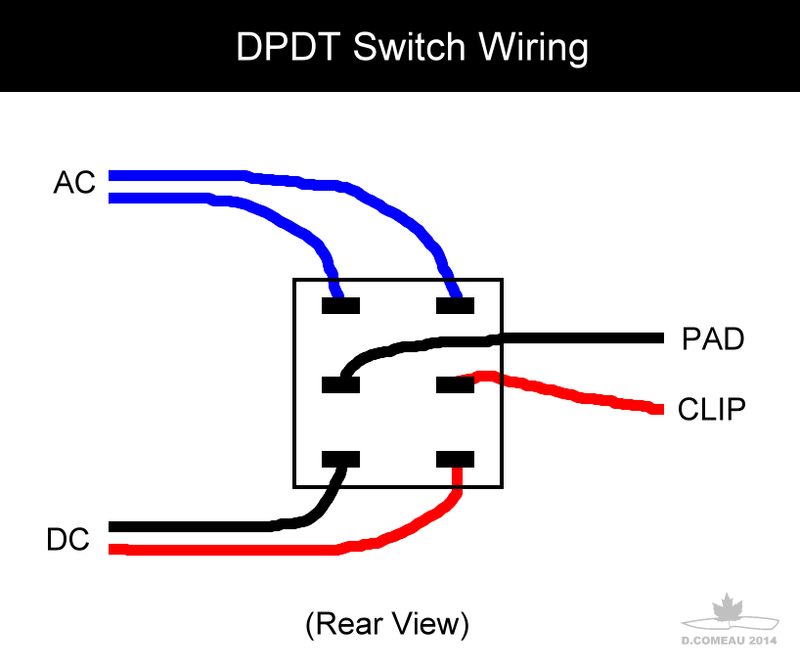 The switch allows either AC (blue wires) or DC (red/black wires) to connect to the pad and clip. Note: I use red to define the DC+ wire, but this may be black w/stripe as it's coming straight off the adapter. 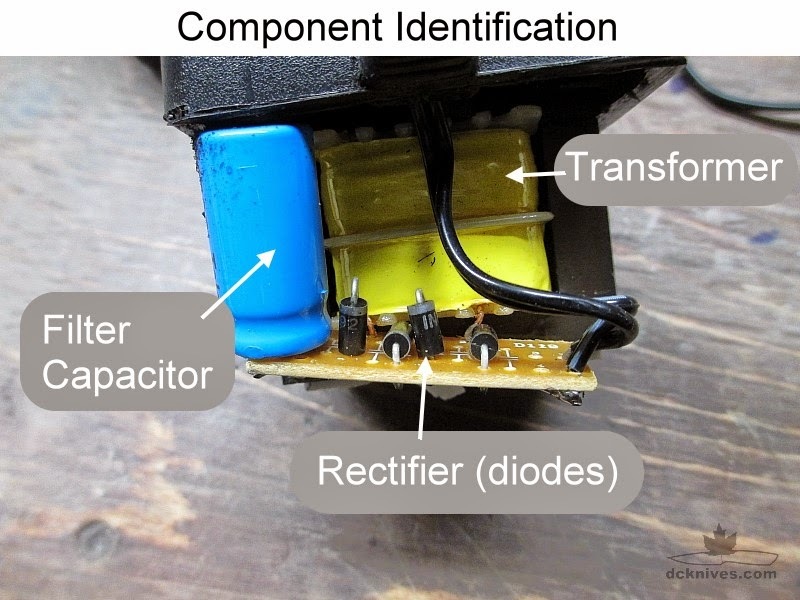 First we are going to locate the output of the transformer and attached the blue wires like shown in the schematic. So where is the output of the transformer? 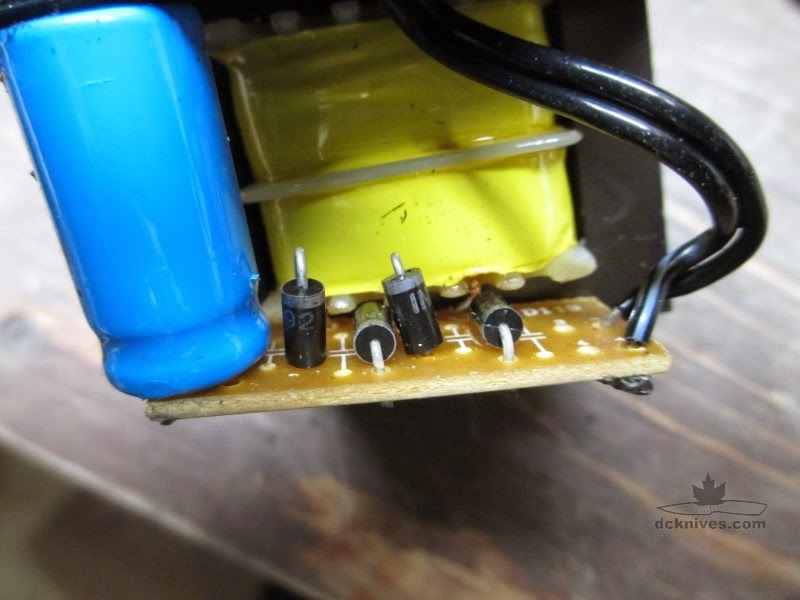 Do you see the small copper wires coming out of the transformer going into the circuit board? Most of the time the wires themselves are holding the circuit board in place, but it's possible there may be some glue or tape around them. 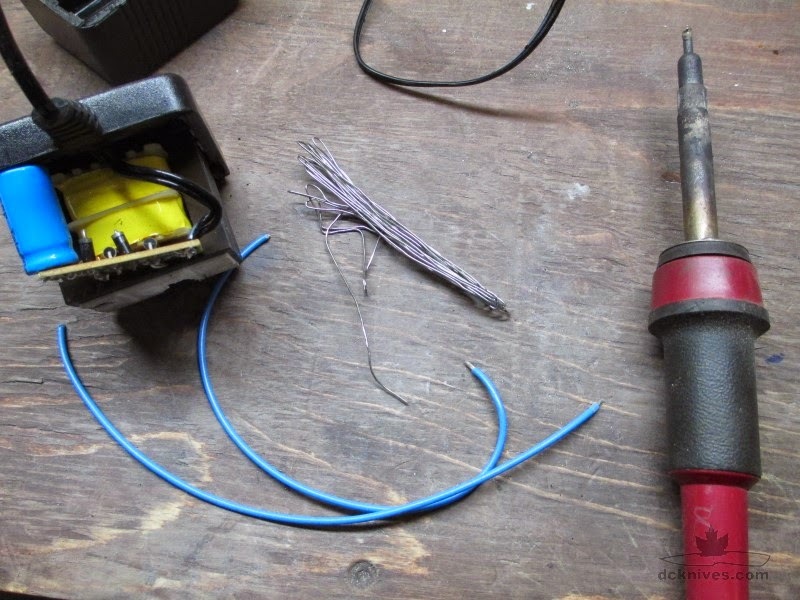 Now I have located the output of the transformer, I get my wires cut and stripped and warm up the soldering iron. These are the wires soldered on the pads where the transformer output connects. Be sure not to accidentally join another pad or leave a blob of solder somewhere it doesn't belong. Here I have made a little room for the blue wires to come out. This will be right next to where the existing DC wires were coming out so watch the orientation of the cap. The wires are out. A piece of tape will hold the cap on until we get the setup tested. The switch must be a Double Pole Double Throw type and will always have 6 pins. The part I had handy was a few bucks from Digi-Key, P/N EG2398-ND which is good for 5 Amperes and 120 Volts. Strip about 1/8 of an inch of insulation and press the wire into the hole. 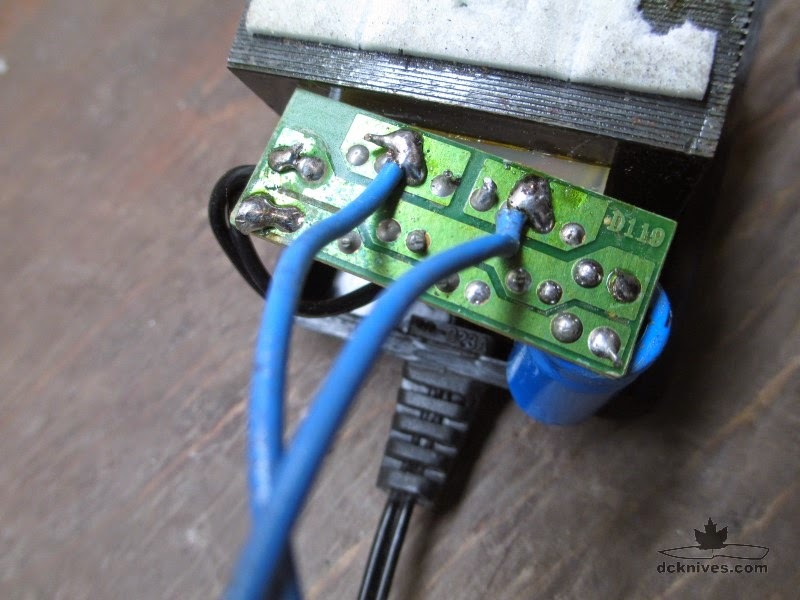 Apply heat from the soldering iron and then flow some solder into joint to make a good connection. The blue wires are AC. The black and red wires are DC. Your wires may be also black and black with stripe. The solid black will normally be DC- and the black with stripe is normally DC +. Here the wires from the adapter are marked with --- (positive). We need to know the polarity of the DC supply so we know what wire will go to the pad and what wire will go to the clip. Cut the adapter wire at about 5 inches. I have a Digital Multimeter (DMM) to help check the polarity.When the plus(red) is going to the clip we are good for etching! Now wire the switch with a red and black wire from the middle terminals. Strip the wire, push it through the switch terminal and fold them over. Then solder them. Connect a red and black wire to the two center terminals. Here's a picture of the switch wired. The AC terminals are on one side, the DC terminals are on the other side and the center is the output. Now we are checking the wiring. In the "etch" position we set the multimeter to DC and check the output on "ETCH". It will read some voltage, say 10 to 18 Volts DC. 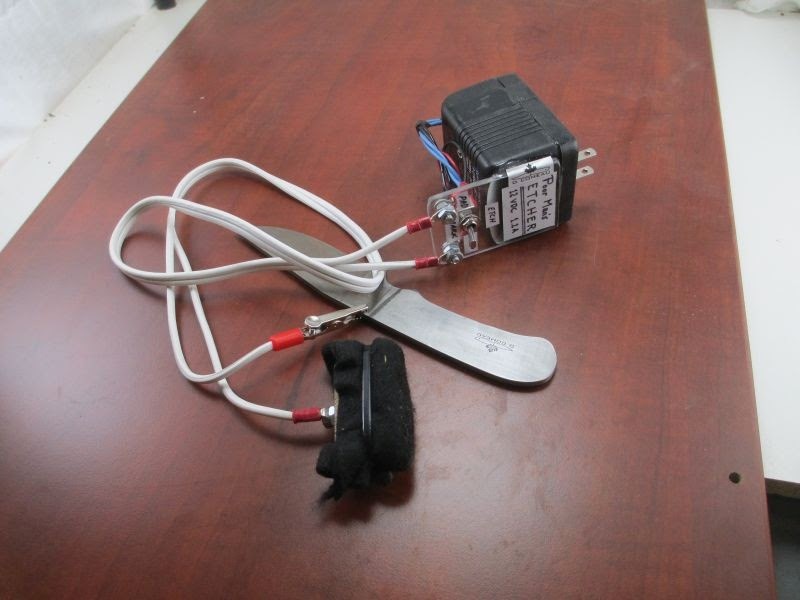 With the meter still connected, flip the toggle switch and check the AC voltage. The AC voltage is smaller usually by about 0.7. This means we are good to go. We can fix the switch to something that will hold it firmly. Built your "poor man's etching unit" over the last few days. Getting stuff together to build this. Great idea. Two questions. What's the salt to water mix or does it matter? Would etching a knife with scales n brass pins mess anything up such as melting epoxy or tarnished pins? Hi Chris, the salt water is the electrolyte (liquid that carries the electricity). Take a 1/4 cup of warm water and dissolve a tablespoon of salt in it. Works ok. I sometimes etch after assembly. The etching process should be cool. If it gets hot you kill your stencil. In no way should it affect your pins, epoxy or anything else other than the steel that is directly under the current. What material do you use for your stencils? I am using a battery charger set at 2 amps to etch with, that works great. But I am currently buying my stencils, and they are very expensive. Can you please provide more information about how to make the stencils? I don't at this time make my own stencils. I buy them from a fellow that makes them for other knifemakers. His name is Ernie Grospitch and he operates Blue Lightning Stencils in Florida. I am curious about the size of the filter capacitor you use in your circuit! I'm not sure about how to find out the correct dimension. Thanks for the feedback Dan, that's where I have been purchasing mine as well. Ernie does great work, and the stencils last a long time with proper use and care. I was hoping to learn how to make the stencils myself in order to experiment with different graphics and things. I love this tutorial, it is very informative as are all your tutorials. I have my eye on a switchable transformer http://www.maplin.co.uk/p/12w-multi-voltage-1000ma-acdc-power-supply-l82bf?cmpid=ppc&gclid=CjwKEAjwuPi3BRClk8TyyMLloxgSJAAC0XsjdSLEZHgyw3OyHSpDcQ_1biKHuyeRz2TsiqVGMQJRVRoCDmjw_wcB and wonder whether this would work without any modification other than removing the jack and adding the pad? Yes, that transformer should work. It appears to have an iron core type step down. Thanks Dan. I'll let you knowhow it goes. Dan, could I interest you in making one of these for me? I can pay by Paypal, and am located in the northeastern part of the U.S. Thanks. That's a great idea. You get some different voltages too. Hi dan!, you have a very nice and helpful blog. Im a little lost with the adapter that is needed for this project. 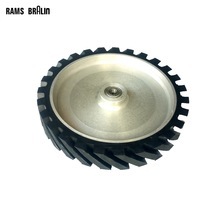 Something like this will do the work? https://http2.mlstatic.com/fuente-switching-12v-1a-regulada-tira-led-cctv-D_NQ_NP_908878-MLA27255998131_042018-F.webp // Or maybe this? https://http2.mlstatic.com/fuente-trafo-switching-adaptador-12v-1a-oferton-D_NQ_NP_971289-MLA25756808003_072017-F.webp //Thank you in advance and greetings from Argentina. The power adapter must NOT be the "switching" variety. The unit must have a step down transformer inside. This transformer is made of iron and will have some weight to it. (Switching units do not have transformers inside.) One clue is the input voltage will be for example 120 VAC OR 230 VAC. NOT a wide range input like 100-240 VAC. 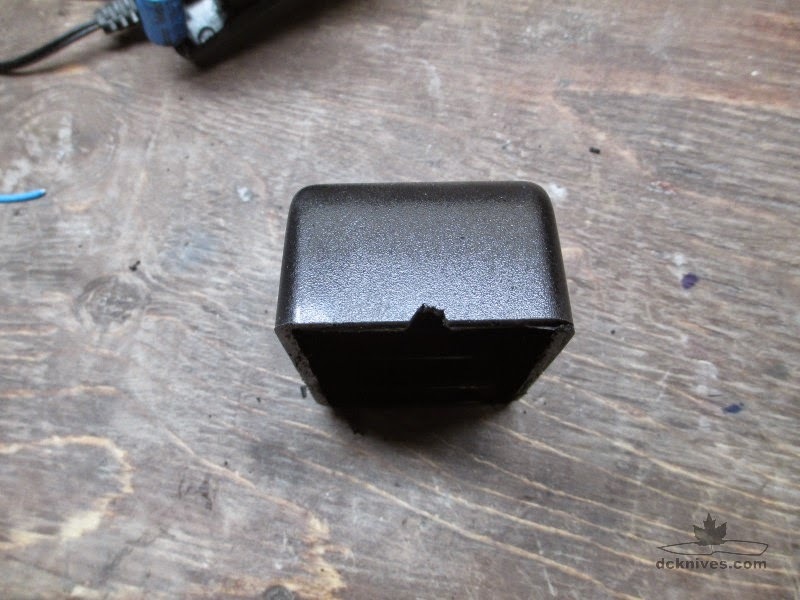 As the old "iron core" adapters are being phased out and becoming harder to find new, you may need to look for one at a second hand store or local junk shop. Hi Dan, how important is the 1 Ampere? I have a power adapter that has all the same stats as yours but I only have 650mA. The 650 mA unit will still etch, however it will take longer than a higher current adapter. As such you will have to hold the pad down for longer. Practice with it and you'll learn the time it takes to get the etch depth you want. Will an adapter with output of 12 v 500 milli ps be sufficient to mark and etch? It will etch. I will take longer contact time to achieve the etch depth vs one with more current. Test it on samples to get learn the best etch times.